A glass floor exposes the thick, aged timber construction of architect Reiulf Ramstad’s Oslo office—both transparent and heroic, barely there and enduring. Just so, his work is a synthesis of opposites: as humble and austere as Norwegian vernacular architecture, old farms with outbuildings of log, birch bark, and sod, and yet as powerful and dynamic as the natural world that surrounds it—glaciers, waterfalls, fjords, and avalanches; whipping winds and brine-laden air. Norway’s often violent geography has always scattered its population and economy like hardy seeds over a dissonant landscape, which means that since opening his office in 1995, it is not uncommon for Ramstad to criss-cross the country with his work, making a mark on places usually visited only by locals, dogsledders, extreme skiers, and base jumpers. His work stands small and resilient in the face of nature, much as those other visitors do, and yet unlike them, it is integrated gently into the landscape. 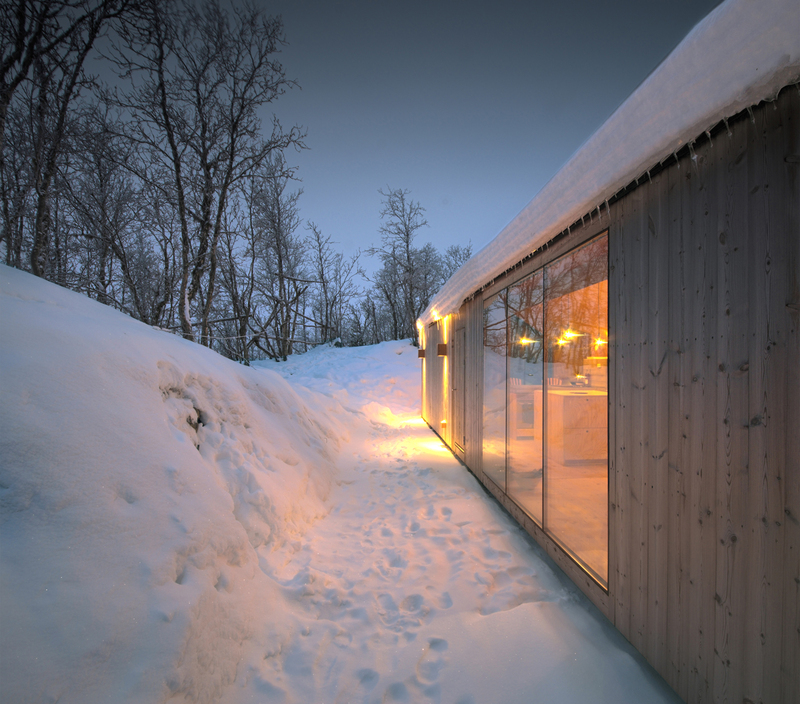 In this vein, he designed two family getaways—Split View Mountain Lodge and V Lodge—with the warmth and sparseness of Scandinavian minimalism, but in such a way as to meld the features of a nest, embraced by the environment, and a bastion, protected from that same environment: both rooted and soaring. “Split View and V Lodge were works of great precision. The two are very site specific,” Ramstad explains. 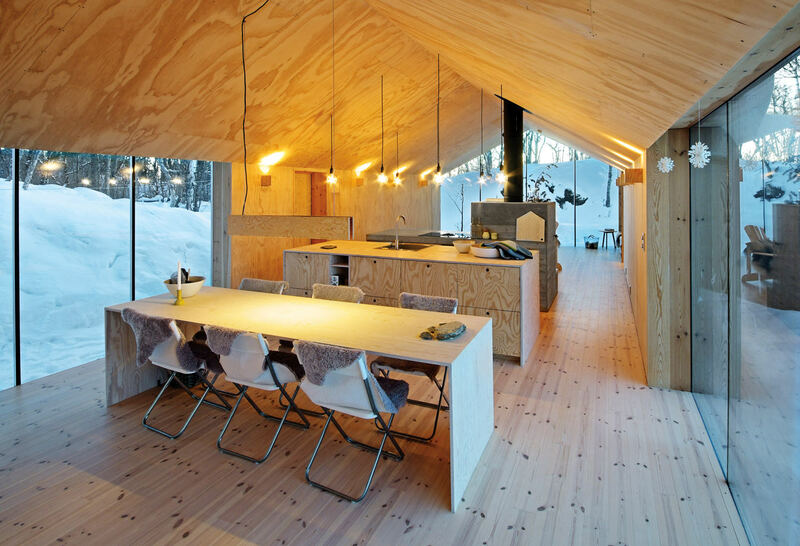 “We didn’t change the context at all; instead, we adapted the buildings entirely to the site.” Split View was built in the Hallingdal Valley for a family of four (with a fifth on the way) and features a small, detached guest annex. 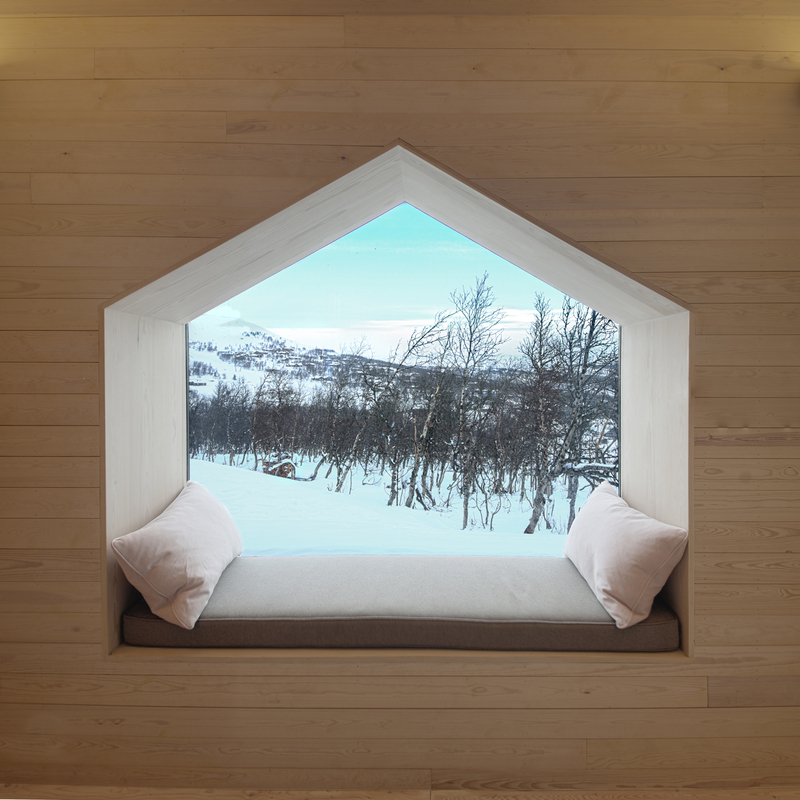 V Lodge, tucked into the mountains above the village of Ål, in an area popular with cross-country skiers and hikers, was built to accommodate a mix of generations. Defined by its simplicity and its consonance with its surroundings, its two volumes come together in a V that follows the contours of the land, stepping down the slight slope to culminate in the entirely windowed southward-facing end-wall that glazes its chamferred vertex. 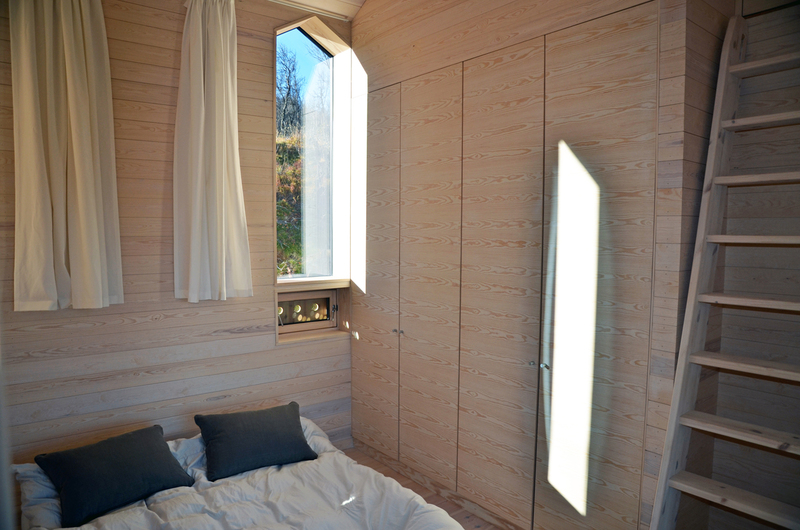 In both houses, Ramstad created a play of micro-architectural “cabins” within the larger architecture, and of the architecture within the larger environment. Ramstad sculpted designs that, from the outside, may appear stolidly symmetrical, even blandly linear, over graded terrain. Inside, however, it becomes clear that the architecture is just as variegated as the land. For Split View’s volumes to respond to the vagaries of the hillside and optimize views outward, the main volume, which holds the bedrooms, splits into a pair of living spaces over multiple levels—a shift in the function of space that exactly maps the landscape beneath it. Each ends in a floor-to-ceiling, wall-to-wall window, as does the annex, which, though detached, completes the trio of precisely framed “split” views that give the house its name. The arms of V Lodge also follow stepped levels, with each level corresponding to a different room. Despite this complexity, the clarity of forms is extreme. 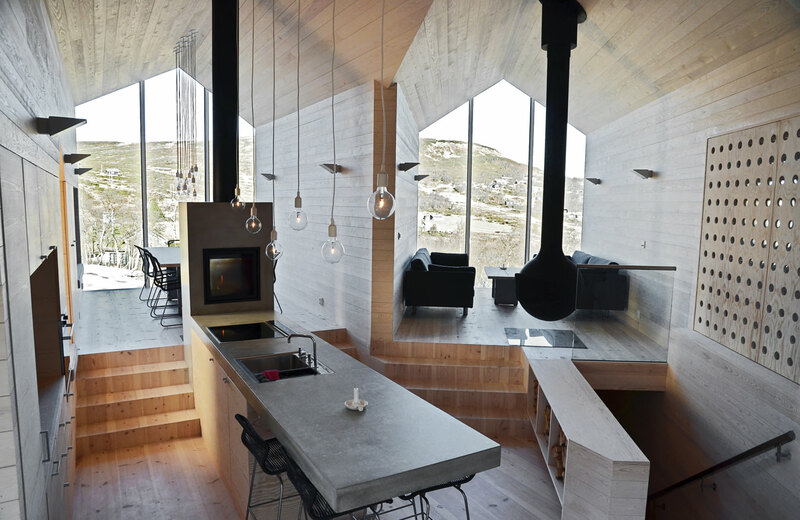 In Split View, as the main volume branches into “cabins”, they extrude outward in the generic pentagonal form of a gabled house—a form derived from traditional Norwegian structures. In V Lodge, he again used this generic house shape, even repeating it inside, in the living room, where he embedded a deep, cabin-shaped niche in one wall, where inhabitants are cozily sheltered from the elements without being cut off from them. Ramstad’s work stands small and resilient in the face of nature and is integrated gently into the landscape. 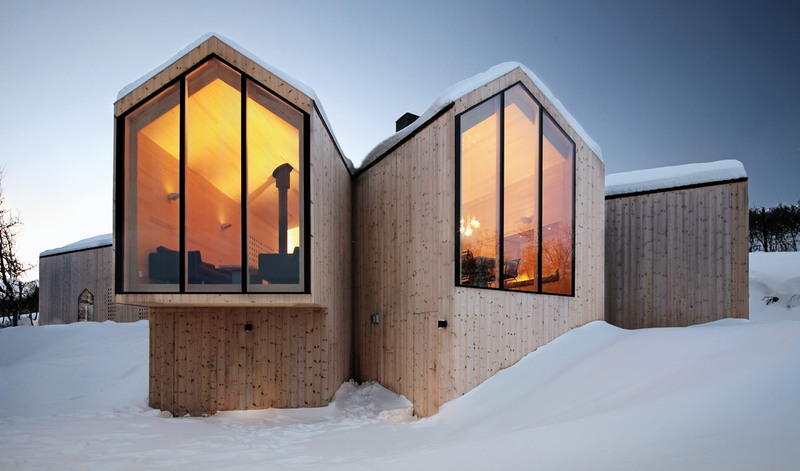 Meanwhile, smaller openings (at least one shaped like a gabled house) also dot the flanks of the extruded “cabins”, forming alcoves and window seats and framing the night sky, the ski slope—proximate views that are human scale in composition. It is the communal spaces that overlook the mountain ranges in the distance. The organization of each structure, however, was not meant only to frame the finest views, but to generate “microclimate zones”, each of which optimizes light, temperatures, and access. Split View’s entrance is sheltered beneath the cantilevered, windowed end of one cabin and leads into a mudroom and hallway, where sliding doors give onto bedrooms, baths, and a sauna. At the point where the house splits, the kitchen forms its heart, anchored with a cantilevering glass fibre–reinforced concrete countertop and a two-sided fireplace. In two directions, four steps up give access to areas for dining and entertaining—slight elevations that follow the land. “The clients’ needs were the starting point, but the most important ingredients were topography, climate, view, light, and the site,” Ramstad explains. He has always insisted that architecture “does not need to be expressive”—his projects err on the side of appearing spare with homogeneous wrappers and clean lines—but what he means is that it should not be unnecessarily so, and neither will he avoid it, if expression is appropriate. At times, expression is something that Ramstad implants in the form of materials whose character emerges and deepens with time and wear. 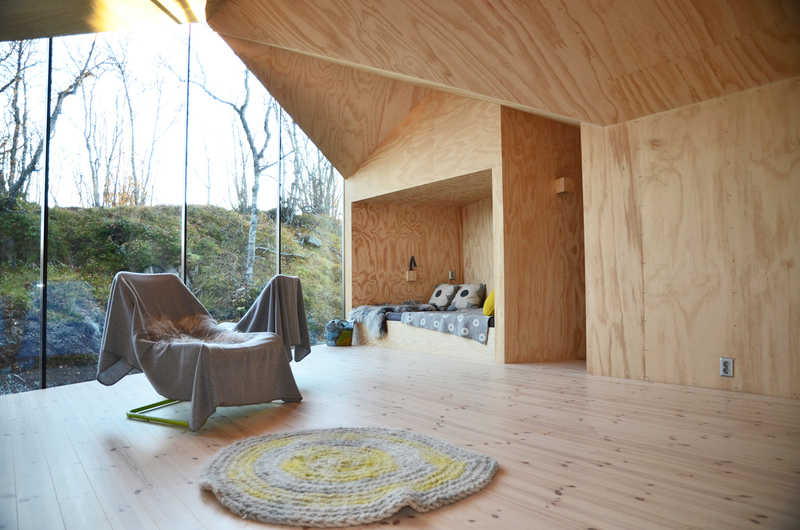 His interest in materials is ranging but he often works with timber, a material abundant in Norway and well suited to its landscape and climate. Instead of oiling or staining it, however, he leaves it untreated so that weathering generates an ever-evolving and unique aesthetic. In Split View, he finished the interior floor, walls, and ceiling monolithically with knot-free joinery timber that conceals even the window frames to create a seamless wrapper. 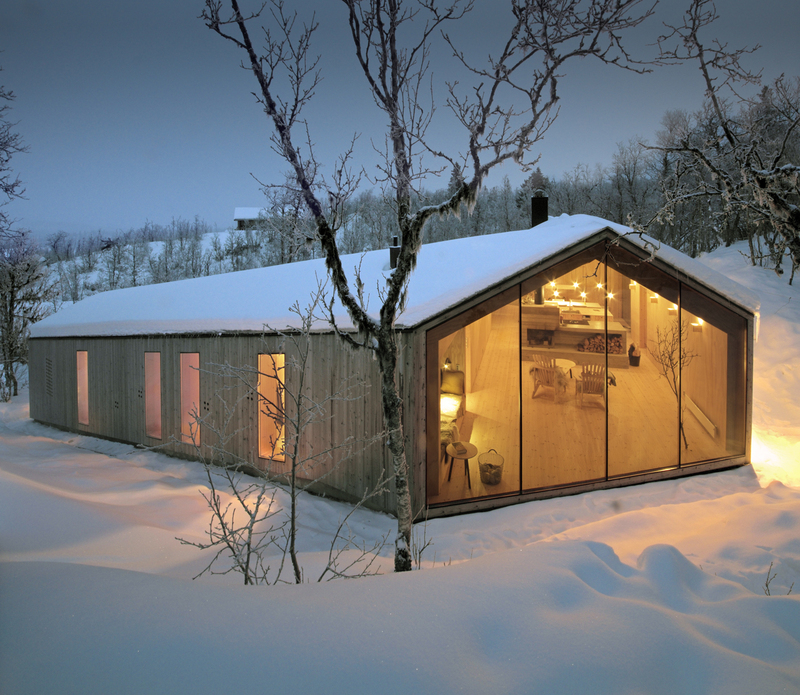 In V Lodge also, Ramstad clad the façade walls and pitched roofs with pine heartwood to create an uninterrupted surface that blends into its surroundings. It is the severity of Norway’s terrain, he insists, that offers an architect the opportunities that come with fierce shifts of scale and context. These shifts can become the foundation for a unique structure that, if not native to its site, at least gives the impression of wholly belonging to the earth, to the sky, or to both simultaneously.